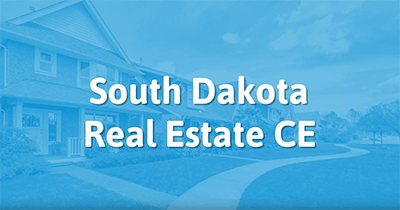 Complete your continuing education to renew your South Dakota real estate license today. All of our courses can be completed At Your Pace online in order to help you maintain your license. Once you finish your class you will have an official certificate of completion available and we will report your course completion to the state for you automatically. We are approved by the South Dakota Department of Labor and Regulation to offer online CE courses. Real Estate Brokers, Broker Associates, Property Managers, and Real Estate Auctioneers renewing an active license must complete at least 24 hours of continuing education during the preceding two license years. At least 12 of these hours must be in required subject areas. This 24-hour course offers a complete CE package for South Dakota real estate licensees and property managers! Our course is state-approved to satisfy your requirements with 12 hours of required topics, and 12 hours of elective topics. Required Subjects Include: Real Estate Contracts, Brokerage Services and Fair Housing.